Portland vs Seattle: Which city has the best food and beer? • Where Is Your Toothbrush? Seattle and Portland, the two major cities in the Pacific Northwest, have a long-standing rivalry, something you’d expect from places in close proximity. The Portland vs Seattle competition manifests itself first and foremost in sports, with the Major League Soccer teams Portland Timbers and Seattle Sounders as prime examples. The rivalry also extends to the cool factor, donuts, bikeability, and public transit. And both cities pride themselves in their culinary and craft beer scene. To explore this latter aspect of the Portland vs Seattle rivalry, we partnered with Laura Lynch, a travel blogger and expat who loves to travel, eat, and drink around the world (and write about her culinary adventures on her new blog Savored Sips). Laura wrote the Seattle portions of this blog post (“Seattle: Dungeness crab” and “Craft beer in Seattle”), and we covered Portland and wrote all the rest. Rather than judging the overall culinary scene in each city, we decided to pick one signature dish each city is known for and face off those two. You might find food in Seattle, Washington to be as good as in any major American city. That the city sits right on the Pacific Ocean coast makes what to eat in Seattle an easy decision. Of all the seafood to eat in Seattle, Dungeness crab is the most iconic choice. In Portland, food carts dominate the culinary scene to the point it’s impossible to pick just one dish or even food category. Which city has better food? Seattle is well known for its fresh-off-the-boat seafood and world-class craft breweries. While some people might try to convince you that Portland is better than Seattle for food and beer, I can only say those people haven’t spent enough time in Seattle because they are very, very wrong. While Portland does have some decent food—I’ll give it that much—Seattle is where it’s at when it comes to seafood, especially shellfish, and particularly Dungeness crab. 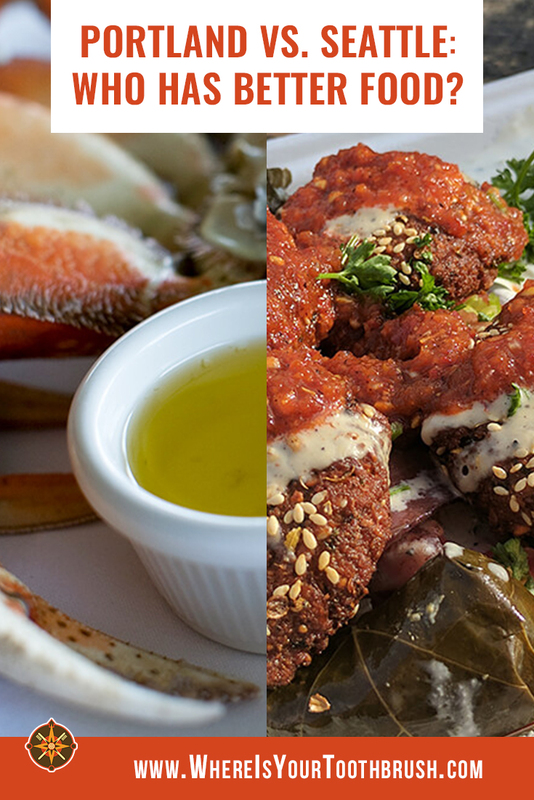 The meat of a Dungeness crab is very succulent and sweet—more so than the coveted King crab. It needs very little preparation to make a tasty dish. In Seattle, it’s available to order in most restaurants that serve local food, if not year-round, at least during the height of the crabbing season. When a plate of steamed Dungeness arrives at your table, you’ll understand why I say Seattle does it best. 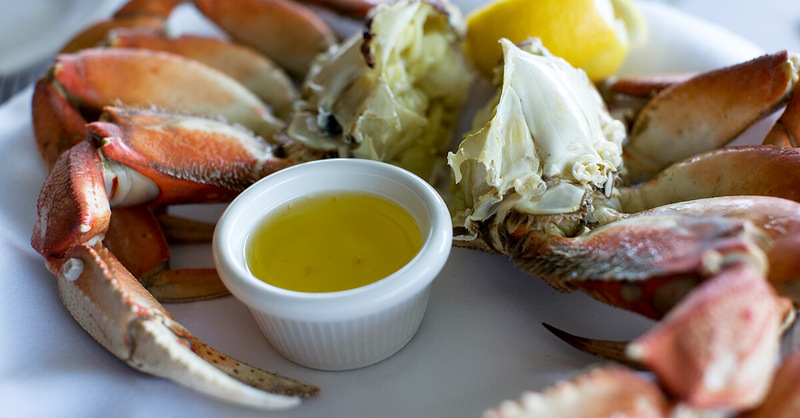 Most Seattle restaurants serve whole Dungeness crab, crab legs, and various dishes including the succulent crab meat. One of my favorite places in Seattle to order it is at Elliott’s Oyster House on the downtown waterfront. Elliott’s is a classy restaurant with a fantastic view of Elliott Bay and an extensive menu of local favorites. To add to the reasons why Seattle reigns over Portland, there are many beaches and marinas nearby where you can go shell-fishing to catch your own Dungeness crab, which is definitely the king of the ocean for this area. While there are Dungeness crab to be had in Portland too, you have to drive at least an hour to get to a beach where you can catch your own. Dungeness crabbing is a beloved pastime for Pacific Northwesterners. We spend hours on the beach with our crab traps and nets, hoping to bring home a few of these tasty crustaceans. Netting a Dungeness crab of your own will save you a good amount of money, as these crabs typically sell for around $10 a pound, weighing around 2.5 or 3 pounds each. Plus, it’s good fun. 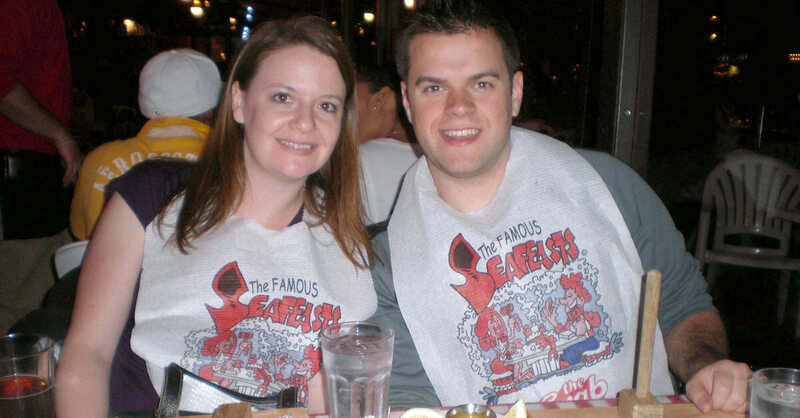 Laura and Nick Lynch eating crab in Seattle. Another of my favorite places to eat in Seattle is Pike Place Chowder, where you can get delicious clam chowder. I often find that visitors to Seattle don’t know about it unless they’ve done their homework in advance or they stumble upon it. There is a very popular, but tiny, location in Pike Place Market that is always packed with tourists who have managed to find it. There is also another small location in the Pacific Center mall just east of the market, where you can get the same great chowders with no lines. The chowder (both the New England clam chowder and their irresistible smoked salmon chowder) is decadent, creamy, and packed full of that fresher-than-fresh shellfish I promised you Seattle does best. We’ve lived in and loved Portland for almost 15 years yet when it came to picking a signature dish to square off against Seattle’s Dungeness crab, we drew a blank (no you don’t have to have a Voodoo Donut, tourist). Generally, Portlanders, both original and transplants, are proud of the food scene here, but to us it leans too much toward comfort foods—adequate for the 10 month-long rainy season we get here but not anything to boast about. A local rag once nicknamed the city Porklandia. The same way cupcakes took America by the sweet tooth a few years ago, every now and then a new dish or cuisine enters the Portland food scene and owns it for a while—waffles! Schnitzelwich! Korean tacos! ramen! khao man gai! bacon on everything! This makes for a thriving food culture in Portland, allowing locals and visitors alike to discover new cuisines, flavors, and ingredients. Despite how many dishes you simply must eat in Portland at any one time, there is simply no agreement what Portland’s signature dish is. Eater lists 25 iconic dishes in a recent attempt to pin down the one. And the consensus in a Yelp Q&A is that Portland’s signature food is beer (more on that later). 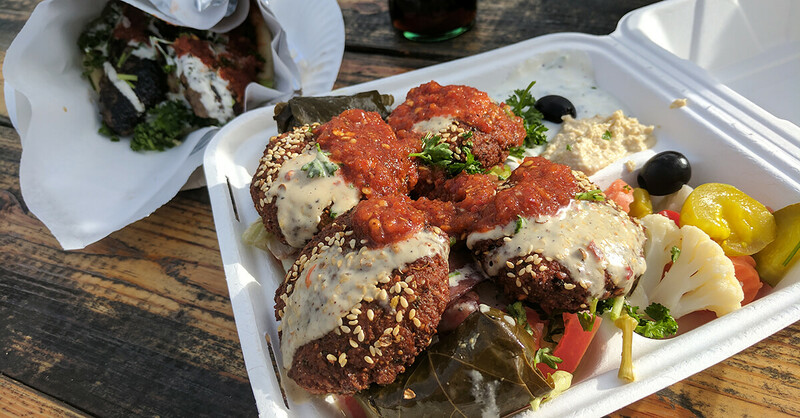 A felafel platter at a Portland food cart. If you visit Portland, you must eat at a food cart. There are more than 500 carts in Portland (five times more than in Seattle), offering a wide variety of world cuisines and fusions from downtown to the city’s farthest reaches. They come and go like comets. The one we named as the most underrated food cart in Portland a few months ago is no longer there. The best (or at least the most popular) ones, like Guero or Lardo, open brick-and-mortar restaurants. If this were a Portland vs. Seattle food cart smackdown, we’d win by a long margin. Likewise, brunch is huge in Portland. Witness the long lines outside Screen Door or Pine Street Biscuits at peak hours, and you’d think brunch in Portland is to die for (or at least spend a long time waiting for). But neither “food carts” nor “brunch” is really a dish. We were tempted to go with salmon, which spawn in the Columbia River, but seafood isn’t really a thing in Portland. We haven’t eaten seafood in Portland once. Our search for the most Portland of all foods yielded many options, none of which emerged as the winner. 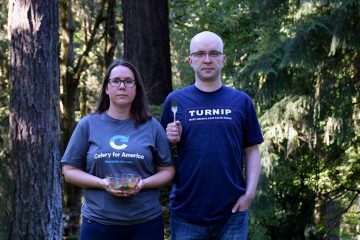 We couldn’t decide what dish would represent us in the Portland vs Seattle culinary smackdown. There’s nothing more Portland than that. Find Portland’s best (and weirdest) carts, restaurants, dive bars, and other joints in 365 Weird Things to Do in Portland, Oregon (ebook, $6.99). Tell a Portlander beer’s better someplace else, they’ll punch you in the face, at least with their eyes and definitely with an ironic twist. A Seattleite will scoff at the notion the small town down south (in California’s Canada, no less) would dare to think beer’s better there. 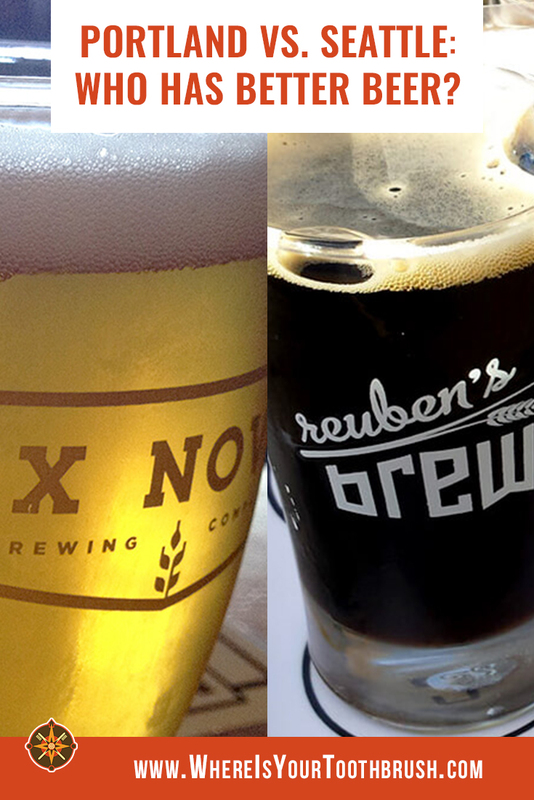 The Portland vs Seattle rivalry takes its most delicious form in craft beer. Craft beer has become popular all over the world in recent years, but it first started to gain popularity in Portland and Seattle. Both of these cities are now known worldwide as the pioneers of craft beer. Seattle truly embraces the beer culture, with frequent beer festivals, Seattle Beer Week, and with the growing popularity of home brewing. Now, I don’t want to get loyal craft beer fans worked up, but Seattle is definitely the best city on the West Coast for beer lovers. 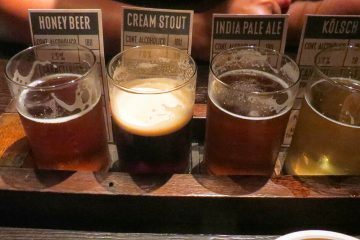 It is well known for its abundance of craft breweries and its innovations in brewing. There are now dozens of breweries in Seattle who are making various types of beer. One of the most popular types of beer in Seattle is IPA, which are made with hops that are grown in the Pacific Northwest. The locals prefer beer with really high IBUs (International Bitterness Units), which means the beer is bitter and hoppy. A sampler at Seattle brewery Reuben’s brews. 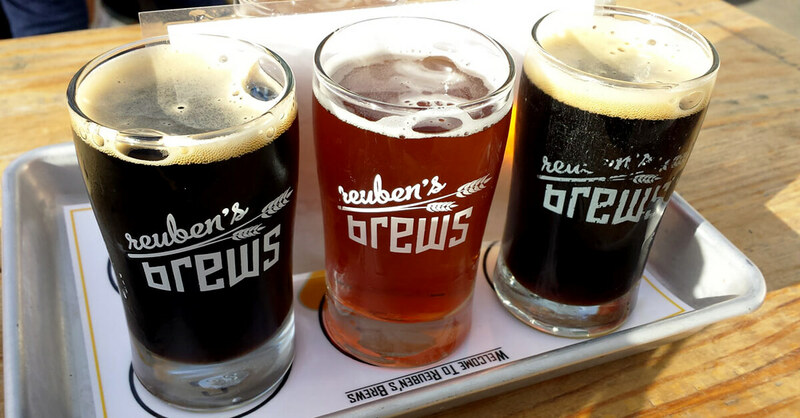 One of Seattle’s favorite activities on the weekends is doing a beer crawl. A lot of the breweries are open to the public for tastings. Two of the largest craft breweries in Seattle are Georgetown Brewing Company (makers of the popular Manny’s Pale Ale) and Pike Brewing Company (makers of the popular Kilt Lifter Scotch-style ale). For IPAs, one of the favorites in Seattle is Fremont Brewing Company. If you’re really looking for great food and beer, you should look no further than Seattle. It has it all, plus views for days and incredible scenery everywhere you turn. Portland is fun for a few days, but Seattle’s where it’s at. Though Portland proper is roughly comparable with Seattle proper in terms of both population and area square mileage (the Seattle metropolitan area is 50% bigger than Portland’s), Portland has more microbreweries both in total—68 to 55—and in terms of density—11 to Seattle’s 8 per 100,000 residents(2016 figures). Lindsay and Peter enjoying beer at Lucky Labrador. 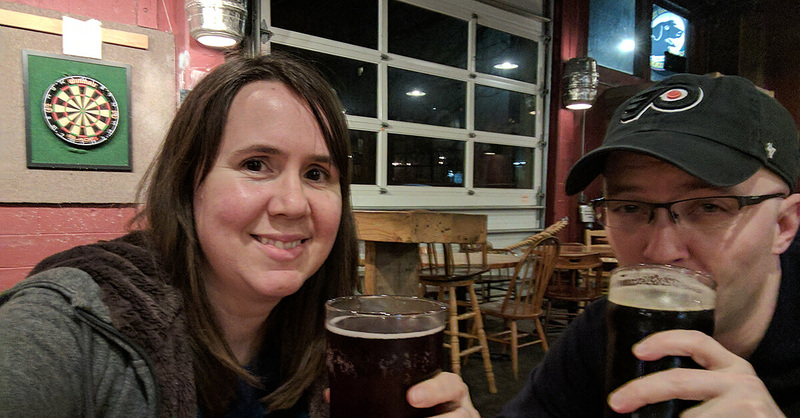 We’ve been visiting and reviewing Portland breweries since this spring, and we’re barely halfway through (see our North Portland and Northwest Portland breweries roundups). There’s simply too many breweries to visit, too much beer to drink. Why would a beer fan want to be anywhere else, let alone Seattle? Truly, when it comes to beer, Portlanders don’t even bother casting a gaze north. We know the truth. The numbers alone should put an end to any debate which city is better for beer. But we’ll keep piling on because, while views may have an edge in Seattle, brews are better in Portland. Don’t take our word for it: fine publications from Travel+Leisure to Thrillist to CNN to Bustle, to even Seattle’s own Post Intelligencer rank Portland higher than Seattle for craft beer (and with the exception of PI, which you can’t trust because it’s a Seattle rag, Portland consistently ranks as the Number One Beer City in the country). Portland loves its IPAs, too; doomed is the brewery that eschews the style. But down here, the Hop Wars, the era when breweries competed on who can make the hoppiest IPA, are long over. IPAs provide a foundation for a great deal of experimentation, even play, on part of brewers around the city. Belgian styles, like saisons and farmhouse ales and sours, have swept through town, becoming a staple offering at breweries and pubs everywhere. There is nary a brewery that doesn’t make a gose, a salty wheat beer. 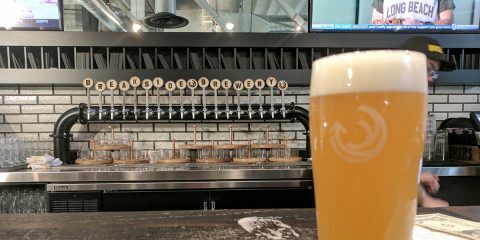 One Portland brewery is even fighting the Pacific Northwest AKA West Coast IPA with the New England hazy IPA import; and Portland has the world’s first nonprofit brewery as well. 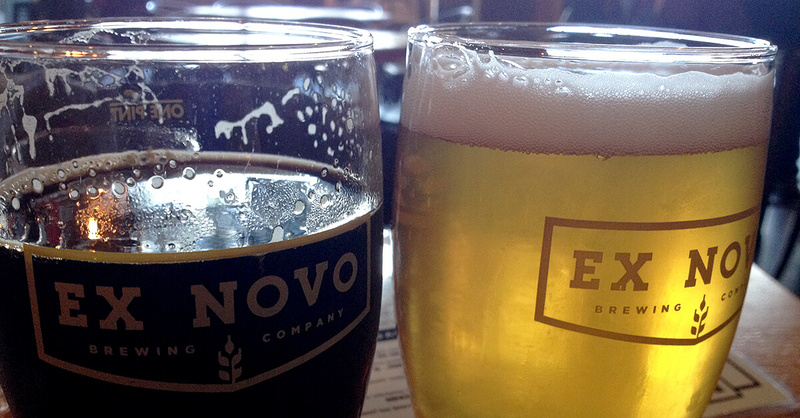 Beer at Ex Novo, world’s first nonprofit brewery. The best part: You can walk to most breweries. There’s a brewery within a mile or two wherever you are in the city. Five North Portland breweries even partnered to create the NoPo Industrial Ale Trail, a mile-long brewery-to-brewery walk. Finally, remember all that comfort food we talked about earlier? Beer is the ideal pairing for it. Because who wants to drink microbrews with crab? 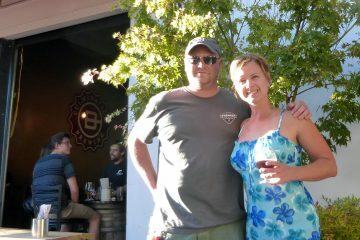 Some of Portland’s best best breweries made it to the ebook 365 Weird Things to Do in Portland, Oregon. Check it out! Though roughly comparable in size, Portland retains the feel of a small city (though that’s rapidly changing), while Seattle has the cachet of a major American metropolis. Sometimes, we feel, the Portland vs Seattle rivalry has to do with the former’s little brother complex toward the bigger, more grownup bro. No matter, we’ll always have the rain. 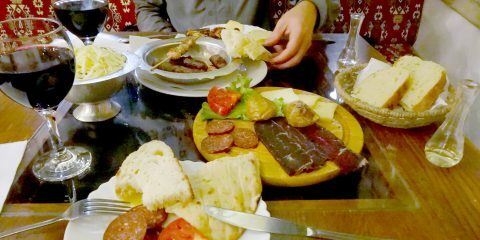 If you can’t decide which city to visit for the food or beer, you’re in luck. Portland isn’t far from Seattle at all. The distance between Seattle and Portland is only 174 miles. The trip from Seattle to Portland, whether you take the bus or drive, takes only about three hours (the train from Portland to Seattle takes a bit longer, almost 4 hours). And you can make several nice stops along the way, including in the Washington capital, Olymypia. In other words, why choose between the two or try to decide which is better? You can eat and drink in both cities on the same day! …though of course only Portland boasts being weird. Don’t believe us? 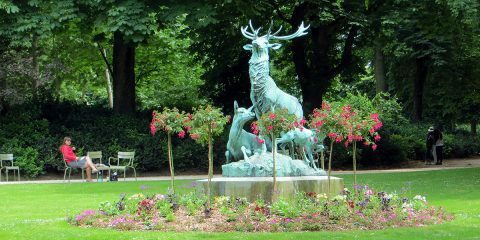 Check out our ebook 365 Weird Things to Do in Portland, Oregon! What’s your favorite? Portland or Seattle? Seattle or Portland? * Section written by Laura Lynch, who also contributed the photographs. ** For this reason, the Brewers Association recently developed the Independent Craft Brewer Seal. Look for the inverted bottle logo at the entrance of any brewery to see if they are (still) independent. I have been to Seattle and like it there a lot and I love the Dungeness crab! I have not been to Portland yet, but will have go in the future to try the food carts. I can’t believe there are 500 of them! You won’t go hungry in Portland, that’s for sure. 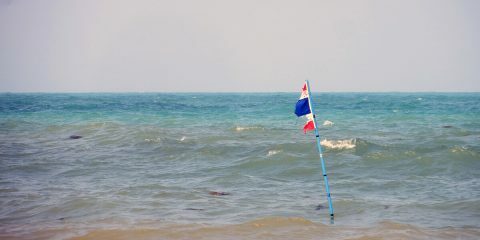 It would be hard for me to choose, I love seafood and I also love funky inventive places and a cool brunch spot. So I guess I would definitely visiting both cities for the delicious food & scene. True, why choose one or the other if you can do both! Not a big fan of beer. Local food takes my whole attention. The food cart concept… is it the same as street food that one gets in Malaysia? I would love to experience this. Kind of. Malaysian street food is served out of more-or-less stationary stalls, most frequently concentrated in hawker centres. Most of the food carts in Portland are trailers (though there are some actual trucks, which are essentially big vans), which are bigger than stalls and which can be hauled behind a vehicle. Funny, I loved the food in Portland more than Seattle, but I never looked at it in that light where there’s no signature dish. I didn’t really have a favorite restaurant either, just a bunch I would cycle through while I constantly tried new things. Last I heard, Portland has more microbreweries than any other city in the world, and was voted best beer city in the world by an international panel of judges. Having said that, I still love the food in Seattle, and will need to get to Elliott’s Oyster House to try the Dungeness Crab. OMG, and I’ll never find better clam chowder than at Pike’s Place. No one in the world seems to know how to make it as good. Well, we’re a little biased in favor of Portland, too, but we can’t have everything. So Seattle wins in food and Portland in beer! What a great contest. I grew up in Seattle, so I’ll probably be biased, but I loved all the great food there, especially in and around Pike Place Market and downtown Seattle. The best frozen yogurt I’ve ever had is there (Shy Giant in the Pike Place Market), the best fish and chowder (Ivar’s), and Seattle was also the first place I ever visited a Benihana’s and their unique cuisine and demonstrations. I don’t drink beer so I can’t comment on that. The only thing I remember eating in Portland was a deep dish pizza — that was also amazing! Totally biased 😉 I have to admit, I haven’t eaten out much in Seattle, I should make a culinary trip one of these days, it’s only 3 hours away. Haha! The culinary smackdown header cracked me up, but it’s so true! I’m an IPA lover, so I’d love those hoppy Seattle brews. However I’m an Asheville girl (my husband and I met while living there) and we have the most breweries per capita so maybe we have the numbers haha 😉 But this post has me wanting to do an epic beer trip through Seattle and Portland to decide for myself! You wish, Paige 😉 Portland, Maine beats Asheville by 4 breweries per capita and Boulder, Colorado by a hair (or should I say, sip). See here. 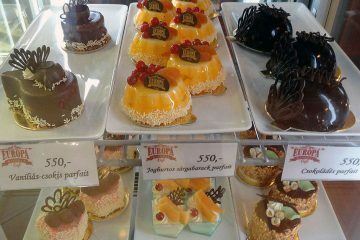 It is always difficult to choose one city over the other when it comes to food or for that matter anything else. I feel each place has its own unique appeal. But probably that is the reason you have zeroed in on one dish and then compared it across the different options available in Portland and Seattle. Been to both cities, and Portland wins for me. Seattle has amazing seafood (loved Pike Place Chowder as well), but Portland just has so much more to offer. The food carts allow for easy access to different cuisines, perfect for trying something new. That’s absolutely right, Kim. We love Portland’s food carts! That’s a very tough competition, but I think I stay with Seattle. When in Portland, I went on too many trips to parks and farms, that my memory of the city is very blurry. Sounds like you need a different guide for your next visit to Portland, Pedro. Let us know when you’re here next and we’ll do our best to set the record straight for you.